Safety in the workshop is of prime importance when using wood carving tools. These tools have sharp cutting edges, and many of them have pointed ends as well. Do not point them toward any parts of the body. While clean, sharp tools are less dangerous to use than blunt ones, always keep fingers and hands behind the cutting edge. Sharp tools are easier to control; a blunt tool may be pushed out of control at the end of the cut by the increased force needed to push it through the wood. Work at a sturdy, stable workbench or surface, and make sure the item worked on is securely anchored. Keep both hands on the tool, and don't let tools lie loose on the bench nor let them project out where hands could be injured by them. If the project must be worked on with one hand guiding the tool, use a mallet to make the cut. Wear a mask and safety glasses when sanding the wood or chipping with a mallet. Sweep up debris regularly to prevent slipping on chips or sawdust. Be sure that the area is well lit, and don't work when you are fatigued. Banging on a tool handle with the palm of the hand can also cause injury. Use a mallet instead. Wear gloves if necessary to protect hands from sharp or rough wood edges. Wood splinters, especially from certain exotic hardwoods, can cause allergic reactions or even infections. A first aid box should be available in the woodcarver's workshop. 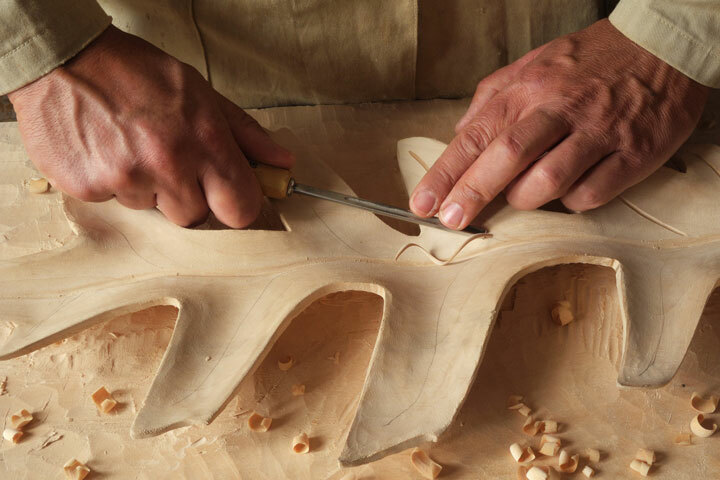 Keep all carving tools securely stored to prevent possible injuries should children and other visitors arrive. A fire extinguisher should be handy — remember that wood carving produces flammable shavings and dust.